Recommendation to increase my audio hearing experience. Discussion in 'Introductions, Help and Recommendations' started by sagor1, Oct 3, 2017. I just received my most anticipated product buy from online. I am not audiophile.But i am so much excited to hear the high impedance earphone sound.But I can't hear any magical difference compare to my apple earpods.Actually my apple earpods sound like more open to me. I tested it on my lg g6 quad dac.When i enable my dac it's only gain the volume.Other wise it's too low. Bit disappointed.Though my only aim to buy this earphone to check what is quad dac sound like. Any recommend you guys to buy other earphone that can increase my audio experience level at lower price range earphone/earbud.Or should i stick with them? They look a bit cheap IMO, I wouldn't expect a ton of performance from them. As for "high impedance sound" such a thing does not exist. Impedance doesn't have anything to do with sound quality. My HD600 are 300 ohms and my LCD2 is 70 ohms...the LCD2 is miles better in terms of sound even though it has a lower resistance. Earphones and IEMs depend a lot on the fit. If they don't seal your ear canals well you get a lot of noise that gets in the way of the music and in most cases even without noise they won't sound right. It's like being in a quiet room sitting too far from speakers without tuning for proper toe in angles. At the same time, maybe you just can't. I know people who can somehow tune a guitar by ear but can't tell the difference between an HD600 and their Apple iPod bundled earbuds. But they can tell the difference with a Grado. Quad DAC is a marketing term. it's not like it's using four DAC chips. Smartphones have an integrated audio chip with a DAC and headphone driver chip built into one die, like AMD going, "what if we put an Athlon II CPU and an HD6600 into one die? but, like, let's drop the clock speed on HD6600 because we need it to work in a cheap laptop." What the Quad DAC does is more of having several headphone driver circuits in that one die and the DACs are only dual so they're not using what otherwise would have been like using a splitter or something from one DAC circuit inside that chip. Not that multiple DACs would be drastically different in any application. On top of all that, you increase the power, but since the Quad DAC can only be enabled on high impedance loads, you're basically just putting as much power into a 300ohm load as you would a 32ohm load, something a non-Quad DAC can't do. In theory it would have more of a benefit if it was running on a 32ohm load, since that's where the meat of the powerband is and where most headphones and IEMs used with nothing but just a smartphone would be, but they probably want to not do badly on battery test evaluations so they locked it for use only with high impedance loads. Considering how rare high impedance earphones are, the only real use for these in a mobile application is to get around the high output impedance of many integrated audio chips and the circuit they're put in in a smartphone or tablet. But considering high impedance will require more voltage, again it's just allowing you to pour more power into a high impedance load to match what non-Quad DAC chips will pour into a 32ohm load. Considering there are a ton of 16ohm IEMs that work fine with just 5mW of power from a smartphone audio chip, you'd have a better time buying a 16 to 70ohm, 100dB/1mW sensitivity IEM of a kind of sound you prefer than messing around with a rather pointless feature meant mostly for marketing. Not that I won't get the LG V-series (especially with the Note8's ridiculous price tag) - I'd just use it for its really good output without messing around with Quad DAC. Any recommend you guys to buy other earphone that can increase my audio experience level at lower price range earphone. have you heard of the term "synergy"? Basically how good do the sum of the parts sound. similar to what Cossix was saying to you, the impedance definitely makes a difference in SQ, Plus all the factors of the sound coming together... I have listened to some amp/DAC chains that sounded better on mid priced cans then they did with more expensive headphones. Wow so much information.Although maximum things i didn't understand coz i am noob, it will take some time to understand.Though thnx. Waiting for other member suggestion. Bottom line - Quad DAC is mostly a gimmick unless you get a high sensitivity, high impedance CIEM. That way it benefits from more voltage that the Quad DAC can provide while not really needing any more than that. VSD3 actually has a lot of bass. It's just compared to Aurisonics the overall balance is perceived to have less bass because it has comparatively more treble than the Aurisonics that rolls off a lot at the top end. For my ASG-1.3 I just apply a low shelf EQ to trim everything below 800hz on Neutron when using it with locally stored files, then Adapt Sound as a global EQ when using Spotify. TFZ won't be drastically different in terms of how you can deal with the skewed response, and for the VSD3 you can trim the treble to let the bass come out more. Assuming of course this fits. Primary reason why I have the Aurisonics instead of, say, the W2 or the ER6 is because of the ergonomics. If this kind of shell fits in your outer ear concha it spreads the friction around rather than leaving most of hte friction to the eartip and earhook. Sorry for a very late response. Can you please tell me which one of those sound good right out of the box?My ear canal is small i guess, coz only small ear tips fit in my ear.That's why (+Waxing problem) i ignore In-ear Headphone. Here are my ear images for you to check whether VSonic & TFZ fits in my ear or not. Can you please tell me which one of those sound good right out of the box? A few problems here. What sounds good to me might not be the same to you, so keep that in mind. I personally prefer the KZ ZST. The VSD3 isn't that much better but it's 3x the price. Second, that also depends on the fit, and the VSD3 came with ones that I really did not like. I put Sony Hybrid tips on them that I originally had for my ASG-1.3. Newer Aurisonics tips are more comfortable but I have a lot of the Sonys. ZST had slightly better tips but I'd probably try the Sonys on them when I get my own unit (I just borrowed my cousin's). But while this was how it was for me, the fit might be reversed for you. My ear canal is small i guess, coz only small ear tips fit in my ear.That's why (+Waxing problem) i ignore In-ear Headphone. It's not the ear canal that's really important here but the concha. Unless your ear canals are absurdly small or large, it's more a matter of finding the right eartips with the right IEM. In your case, you'd want to use an IEM with a small diameter bore so you can use the small size of a thin eartip with less pressing against the plastic or metal bore once the eartips are compressed. You know how in crime shows on TV they take a photo of bloody footprints or footprints under the window that was broken into with a metal ruler next to it? The photo doesn't even have that ruler to give me an idea for the size, and even then, we're not talking about simple shoe size here, but a complex 3D shape on the concha. It has several deviations from a box shape (and so does the IEM shell) and I can't see the depth either. There is no way I can tell what IEMs will fit you based on a photo of your ear. At best, you're going to have to laser scan your ears, and ask anybody with a database of laser-scanned IEMs to check what will fit or not fit in the concha. But if you'd go through the process of going to an audiologist to get your ears laser-scanned, while not everybody with IEMs has 3D scanned theirs (ie you'd have nothing to compare to), might as well save up and get a custom fit IEM. Unexpected ans.I am actually avoiding KZ because it's already available in our country.You remember my purpose of buying another earphone/earbud,right? But it's ok i am gonna soon buy this earphone. My bad I thought you have own or seen those earbuds so that you can guess my ear-size. BTW laser-scanned part is it sarcastic or you mean it.Because i never hear of it before. Any recommend you guys to buy other earphone that can increase my audio experience level at lower price range earphone/earbud. Rock Zircon. I like it more than the ZST or ZS3, the only two other earphones that were recommended that I have. It looks good and is pretty balanced, without the excess bass that you didn't like about the TFZ earphones. If you haven't bought another pair yet I'd say these should be #1 on your list; if you have, they're pretty cheap and always worth getting. I didn't bought KZ zst yet.But i am gonna order it now. But i have confusion seller mention there product differently like some 1DD+1BA hybrid driver,Balance Armature with dynamic etc. So is there any variation in Kz zst? 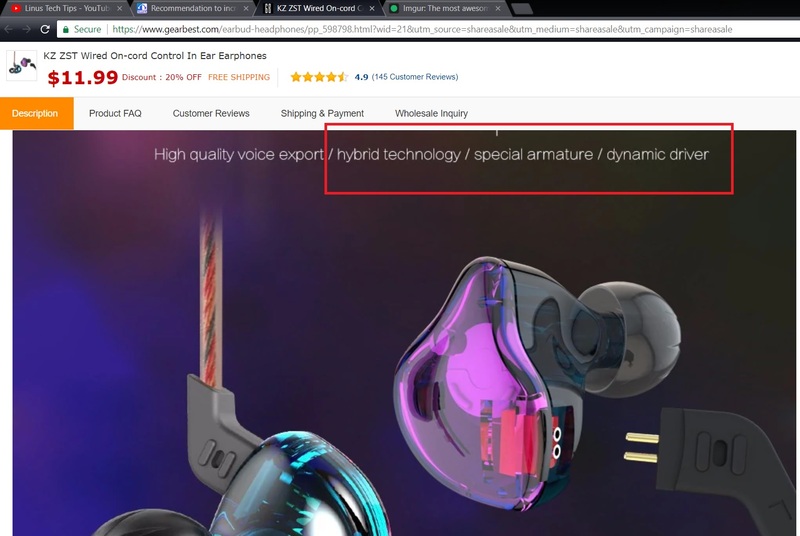 in gearbest web site when i select On-Cord Control,The noise cancellation from the text from the headline go vanish. So is noise cancellation feature related with it? BTW i add Rock Zircon in my bucket list. What exactly is confusing? "Hybrid" design means it has Dynamic Driver + Balanced Armature. Not disappearing when I click on it, but either way it's at a price point where it can't be Active Noise Canceling. Both models have passive noise canceling, ie, they're supposed to seal your ear canals. So there is no variation.Some are not mention the Balance word as well. So there is no variation. Some are not mention the Balance word as well. It's there if you scroll down.